Playa Flamingo offers a dramatic setting reminiscent of the Mediterranean, with ocean view homes clinging to two large points separated by a long, curve of white sand. Flamingo Beach property is on the upper end of the market, with beachfront or ocean view estate homes and luxurious Costa Rica condos. Flamingo beach offers great snorkeling off the north and south points, and is an excellent swimming beach with small waves most of the year. 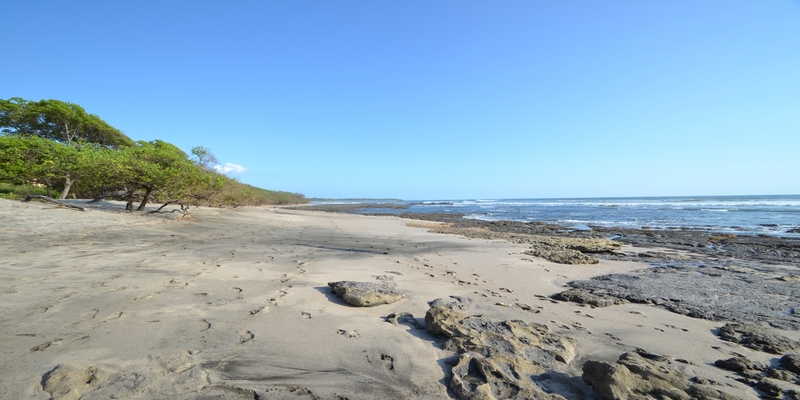 This spectacular beach is also known for its sport fishing and diving, and is the site of a proposed Costa Rica Marina. As a result, sailboats and sunsets characterize many views. The small town is situated on the North Point, which overlooks both Flamingo and Potrero beach. There is a grocery store, several restaurants and some charming shops. Visitors and locals love to have a drink and dinner on the beach at the Coco Loco restaurant, or enjoy a typical meal at Maria's restaurant. Angelina's restaurant is great for pasta and beef. The area is mostly residential, so those looking for more options for dining or shopping will usually travel into Tamarindo, just 40-45 minutes south by car. CRIA School (previously called Country Day School) and La Paz Community School are situated about 10 minutes from Flamingo beach, and the Liberia airport about 45 minutes. We also have an office right in the little town to serve our clients, and some agents dedicated to this beautiful area! Mar Vista is one of our favorite communities with ocean view building sites in the Flamingo Beach area. The development has lots available from the developer and resale opportunities. Property owners can enjoy the breath taking views from the swimming pool or restaurant of the clubhouse. The Oceanica features elegantly designed two and three bedroom condominiums with spectacular sunset views. The Flamingo Marina Resort which is located directly on Flamingo Bay and has a variety of units over looking the proposed site for the new Flamingo marina. It is a perfect place to have a drink from your private balcony while watching the sail boats and fishing boats. There is a hotel on the property that has a fun bar and restaurant. Presidential condominiums and Sunset Heights feature two and three bedroom condos and are located just a short walk to the mini supermarket and the restaurants in town. There are units that have views of Flamingo Bay and Flamingo Beach. The new Flamingo 360 tower have gorgeous and brand new ocean view condos available. Ask us for an update on this project. The Palms features oceanfront 2 and 3 bed villas directly on the white sand beach of Playa Flamingo. There's also a gated community just before entering the village called Altos de Flamingo. This community is composed of homes and condos. We created a little website that gives an idea of the price range for each condo complexes and gated communities of Playa Flamingo and surrounded areas. Click here to access: www.propertiesinflamingo.cr. Please ask your RE/MAX agent the real estate opportunities currently available in Flamingo in these projects and other developments in the area.